The Q-Connect Q6CC is a cross-cut home shredder capable of shredding up to 6 sheets of paper at a time. It shreds material into pieces that are 4.6 x 47mm and has a P-3 security rating (ideal for the shredding of confidential documents). In addition to paper, the Q6CC will also get through small paperclips and staples which means you don’t have to spend time removing these prior to shredding. 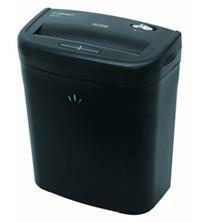 It can also shred credit cards, very handy for destroying old bank cards that are no longer needed. Bin capacity is 9 litres and the shredder has a lift-off head for emptying the waste basket. There is also an added safety feature whereby the shredder cuts out when the head is removed, to help avoid any accidents.